One of the top questions I receive has something to do with cleaning a shower, cleaning soap scum, how to keep a shower clean, etc. Showers are tough. If it’s a shower that’s used regularly, it’s damp and has a fair amount of moisture that needs to fully dry on a daily basis. If it isn’t used on a daily or weekly basis it still needs a quick wipe down to keep it clean and dust-free. 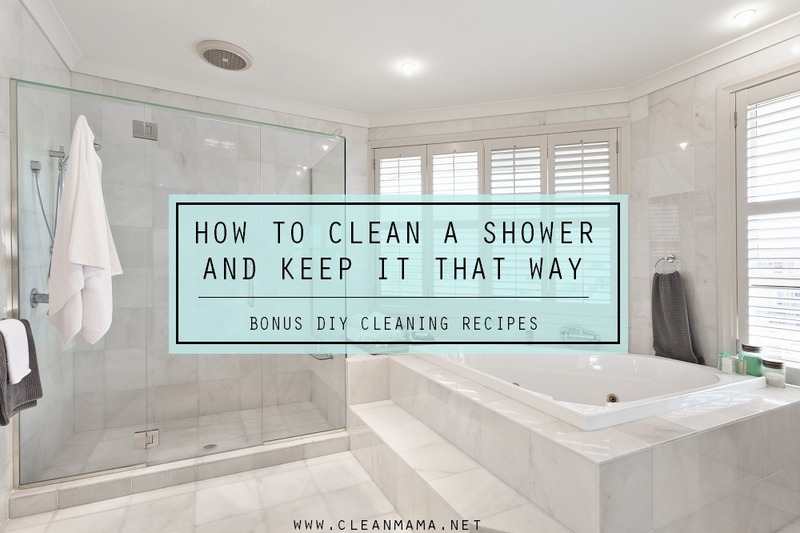 I have a pretty simple process that helps me maintain a CLEAN and MILDEW-FREE shower – want to see what I do and what I use? Keep reading! Use a daily shower spray – I have a recipe in my book for a Peppermint Daily Shower Cleaner Spray and Method brand has a Daily Shower Spray that works really well too. Using a daily shower spray will keep soap scum and mildew at bay and make it easier to clean your shower. Use a squeegee at the end of your shower to remove excess water and to prevent water spots. Mix and store in a spray bottle. Spray shower or tub daily after showering has occurred. No rinse needed. Spray cleaner on walls, tiles, shower surround, faucets, shower head, etc. Let sit for 10-15 minutes. Scrub clean and rinse thoroughly. This is part of my Monday cleaning routine – you can see how I speed clean all the bathrooms in my house here. Some people swear by using a combination of equal parts white vinegar and dish soap in a handled sponge dispenser. Try that technique if you’d like and see if that works for you. 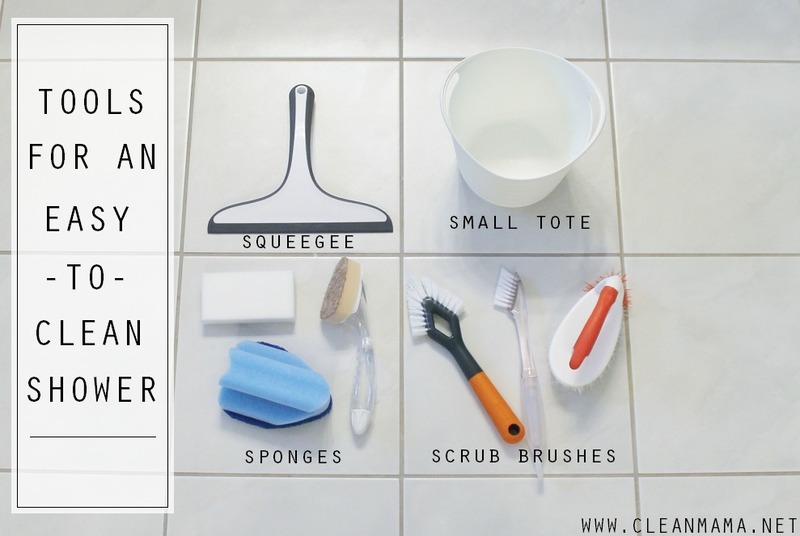 My favorite DIY recipe for bathroom cleaning? Lavender + Lemon Bathroom Disinfecting Spray. Use a scrub (powder or paste) to deep clean your shower. If you have a lot of soap scum, start with SCRUBBING the shower first to get it perfectly clean and then apply the daily and weekly routine. 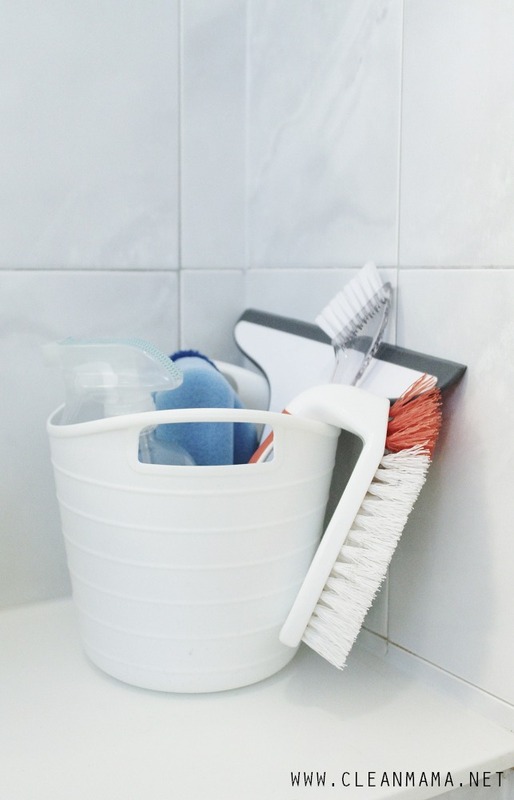 Use a handled scrub brush to effectively clean the grout and tiles. If your shower head isn’t running as strongly as it used to, you can use white vinegar to break down the mineral deposits that have collected over time. All you need is about a cup of white vinegar, a sturdy plastic bag, and a rubber band. Pour about a cup of vinegar into the bag and lift it to the shower head. Make sure that all of the spray holes are covered in the vinegar. Adjust the amount of vinegar if necessary and then secure it to the shower head with the rubber band. It’s important to keep the bag on the shower head for at least 3 hours. After several hours or overnight, remove the bag. Not only will the mineral deposits and residue be removed from the exterior, but the interior will be cleaned as well. Rinse thoroughly and wipe dry. Mold and mildew are not things you want in your bathroom or shower, and they are not things you want to mess around with as they can be dangerous. One way to start fresh is to re-caulk your shower and tub every year or so. It’s a fairly simple process and can be completed with a tube of white silicone caulk specifically designed for bathrooms and kitchens. If there’s more than just a little bit of mold or mildew, call a professional to eradicate the problem first. If you have a little mildew in your shower, spray straight hydrogen peroxide on the spot(s). Let sit for up to an hour and rinse. You can put a clean spray nozzle right on top of a hydrogen peroxide bottle – keep the hydrogen peroxide in the brown container it came in. It loses its effectiveness when it comes in contact with light. Hydrogen peroxide will bleach fabric so be careful where and how you spray the solution. Repeat if necessary. Mix and store in a dark container. Spray liberally on mold/mildew, let sit for 1-2 hours, rinse. Repeat if necessary. Want to jot down these cleaning recipes? 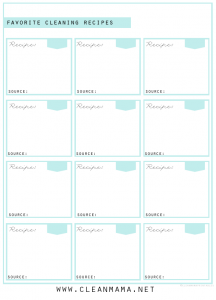 I have a free printable list for that! Great post, Becky. I love all the options. I’ve tried the vinegar/dish soap and didn’t love it. I’m interested to try your recipe for the daily shower cleaner. Can’t wait to see my hubby’s face when I tell him I need to buy vodka to clean the shower. Lol. I buy from amazon a 5 litre container of rubbing alcohol to use instead of vodka. Loads cheaper at around £16 ???? Absolutely. What madness buying vodka for this purpose – would work out to be cheaper buying a ready-made Eco-friendly shower cleaner! Isopropyl alcohol is far cheaper, and at 70% alcohol will evaporate much more cleanly than vodka, which is only 40% alcohol. Also I’d use distilled water in that recipe to eliminate adding minerals to the solution. I like the idea of adding the peppermint oil – which is a natural inhibitor to mildew and mold. But clove, cinnamon, lemon, rosemary and tea tree oils will also do that – so there is a choice to which scent your bathroom has. Don’t like scrubbing soap scum from your shower tile? Use non soap body cleanser and a non-shampoo routine for your showering. Once a month or so I use car wax on the shower walls. Water beads up, rolls down the drain keeping mineral deposits from building up. Speaking of car wax, I use hair cconditionerto wax my car, and it works great! I wonder if it would work in the shower? I have marble walls andr I have been having trouble finding a product that will work on that. Mr clean erasers don’t work. Any suggestions that will get soap scum off? You don’t want to use anything acidic (like vinegar) – try my disinfecting cleaner with vodka – that might do the trick! Hi! I’ve been cleaning homes for just under 4 years now. I’ve found that for any granite/slate/marble surfaces, using a mixture of water, rubbing alcohol (similar properties as Vodka and cheaper! ), and a bit of Ivory dish soap plus essential oils (that aren’t citrus), works pretty darn well. Hope this helps! Great post! I’m going to try your recipes! How do you rinse your shower? Do you keep a cup along with your tools? Another spray bottle? I don’t mind cleaning the shower, it’s the rinsing that gets me. Ugh. Where can I get that bucket? I like it. Replace your shower head with a hand held shower head. A must for cleaning showers. 100%- I never put off cleaning my showers when I had a hand-held shower head. Now, neither of my bathrooms have them and it is the #1 reason I do not clean them. I know, awful lol… the one I plan on replacing but the other has a shower head that is directly over the shower so I can’t put one there… the rinsing when I clean just kills me and I agree that is a MUST for ease of cleaning! I have an enameled cast iron bath tub that has stains from adhesive from an old shower door. We removed the door and have a shower curtain but I just can’t get rid of these stains! Do you have any suggestions? Thanks in advance! Elbow grease and a magic eraser are my best suggestions! I would recommend “Goo be gone” it gets rid of the sticky adhesive from stickers etc. May need to do more than 1 time. Lemon or orange essential oil will get the sticky goo off easily! I am sloooowly moving towards all organic cleaners. I have the DW soap and Laundry Soap mastered. Now I’m moving onto the bathrooms. Thanks for the great tips! I love your book!!! You’ve read my mind. Cleaning our 2 walk-in showers is on my to-do list today. Thanks for the recipes. Do you put the Daily spray on first then squeeze it off/dry or the other way around? Also, I bought your book recently which I LOVE! I am working through some of the recipes and I notice many use peppermint. I am not a huge fan of peppermint, but love spearmint instead. So I was wondering if you could clarify whether peppermint alone served a purpose in any the recipes? Or is there something else than can be substituted? Or maybe peppermint has a different scent than what I am think-I am waiting for my EOs to arrive one of which is peppermint (I broke down and got it too). Thanks Becky! Thanks Lisa! Spray first and then squeegee. You can easily sub spearmint, eucalyptus, or another citrus EO for the peppermint or leave it out entirely. I too have been wondering about this, so good timing for me. It’s like I just never learned. Trying to decide if my 6 kids would really squeegee the shower when they are done though….I wish they would!!! What kind of scrub/paste do you use as the monthly clean? I made your peppermint window cleaner spray and LOVED it! It works so well, much better than vinegar and water. Working on getting your book I was so impressed with that recipe. Thank you, I have used your advice a lot! Thank you Lindsay! I use a homemade paste of baking soda and dish soap/castile soap with a scrub brush. Do you use the daily shower spray before or after you squeegee? What do you use for shower glass? The daily shower spray and squeegee. Which cleaning recipe would you use on a shower with a glass door that maybe gets used twice a month? Also, since we take take baths instead of showers, what would be the best thing to use to keep the bathtub clean? For the walls around the bathtub/shower, which formula would you use to wipe that down with? Thanks so much for such an informational blog! St Luke’s Carpet Cleaners Ltd. Thanks for the great post! Gonna make a daily shower cleaning a habit! Just ordered your book to my Kindle, it’s the best! Thank you so much for all the great recipes and tips! Yea!! Double yea!! I had no idea I could get the book on my Kindle! What do you recommend when you have build up of calcium, lime and rust. You can soak the spot with a cloth saturated in vinegar for an hour or so and then scrub and rinse! hello! Loving your posts lately as I’ve committed myself to regular cleaning and organizing – a newly crawling baby has put the pressure on! I have a walk in shower w tan tiles. There is a white build up that I’m not sure is soap or calcium deposits, either way it’s been impossible to remove….. Any suggestions?? Outside of the vinegar, is all of this safe on marble?? Since vinagar & water supposed to be the best glass cleaner for windshields. Would that work well for shower doors? I used Sol-U-Mel and I am straight up shocked at how much the grout was nasty before we moved in. It’s practically gleaming now. I picked up your Organically Clean home from Amazon and it’s filled with great recipes, unfortunately they’ll have to wait until I get these all finished! What would work best for lots of mineral build up for glass shower doors? Have you tried vinegar? That works really well on mineral build up. I have bad mineral build up on my shower door. I’ve tried vinegar, CLR and tilex. Still there. Any other suggestions? Bar keepers friend soft cleanser worked on mine. Could only find it at Bed Bath and Beyond. $3.99. It was AMAZING. Bar Keepers is great and I found mine at a hardware store. Which sponge or scrub brush would you use on your shower door and which cleaning recipe would you use on it to keep soap scum and mineral deposits from forming since it isn’t used that often? Any suggestions for rust stains in tub? The track doors on my shower drive me crazy, any suggestions for keeping them clean? Try toilet bowl cleaning, leave it on for 5 minutes wipe and rinse. My new tub is made of acrylic. I don’t think I can use anything on it that scrubs. Do you have suggestions? Where do you purchase your spray bottles with the tags on them? I’m new to your blog and working slowly to new ways!!! Will purchase your book, too! What kind of vodka to you use? Whatever I have on hand – cheapest you can find is fine! Some great tips I’m looking forward to trying….but find it a bit odd that someone writing a book about Organic cleaning uses a Mr. Clean Magic Eraser. Aren’t those things supposed to be incredibly toxic? There was a rumor going around a couple years ago with the ingredient list and some misconception surrounding the chemical compound/makeup of the Magic Eraser. There is NOT formaldehyde in them, but the chemical compound formaldehyde-melamine-sodium bisulfite copolymer is in them – this is not the same compound but it’s where there’s been confusion. I look to Environmental Working Group for their grades regarding toxic ingredients in cleaners and they grade the plain Magic Eraser as a “B”. The National Institutes of Health also rate it is non-toxic. Now, it’s not biodegradable which makes it not necessarily eco-friendly, but I am okay with using them because they work amazingly well on really tough spots that natural cleaners might struggle with. I don’t use them daily or weekly, it’s as needed. Some things to keep in mind: don’t let kids use or play with them because the melamine foam can cause skin burns if you rub it on your skin, keep them away from pets (as you would any foam object), and rinse the surface completely after scrubbing. I really like your idea of keeping a caddy in the shower itself. It’s really easy for me to procrastinate cleaning my glass doors, but I feel like I wouldn’t have an excuse if I had everything that accessible. I’m a little intimidated by the toothbrush you show in your caddy–do you have to get that involved and intense every time you clean? Hi, before I used to use chemicals in my house, but now I’ve started to use enjo (just fibre and water). This has has halved the cleaning time I used to do alone but not enough. I still take an hour to do each bathroom alone; we have family bathroom, ensuite and downstairs cloakroom. I came across your site after posting a help advice post on local Facebook group. A lady suggested your site which I am so glad she did as your site is so informative. I’m trying to find ways of speeding up my cleaning routine especially as for some reason it takes me at least 5 hrs to do a few rooms in a small 3-bed house of all things! One thing I’ve noticed when I clean the bathrooms, in particular the ensuite is that whilst cleaning I’m getting never ending amounts of what I think is called dust. No matter how many times I go over the same areas, seconds later dust? resurfaces. I end up going over same areas spending at least 30 mins on these troublesome dust zones at least. I’ve switched the toilet paper to quilted and finding that this has made bathroom a little less dusty. I’ve been finding I clean the bathrooms on a daily basis. Shower, toilets and sinks get done on a daily basis as these are used daily, and the bathroom gets done st least once a week or after usage. I have a 19-month old toddler and a baby on way so looking for any advice or tips on how I can get a proper clean done but in less time so I can spend time doing the more important things, looking after and playing with the kids as well as my hobbies arts and crafts. Do you have any tips on how once a bathroom has been cleaned to stop dust re-surfacing seconds later. Also we have tempered glass shower doors and there seems to be a build up of a film from a chemical product I used to use on shower on a daily basis. The spot dry marks are really stubborn to get off. I’ve tried loads of things but nothing seems to shift them.Any tips on what I could use? Thanks in advance. I don’t have tile in my shower. Can I use your shower cleaning solution on the vinyl shower surround? Thanks so much. Can you use rubbing alcohol in place of the Vodka or does it not do the same job? I just bought your book after moving into a house with a wonderful roomy shower that unfortunately gets mildew! Yuck! I tried your peppermint and tea tree oil mildew remover and let it sit for two hours after really spraying it on. Although the mildew did not disappear with just a rinse, It did remove quite easily with a grout/bathroom brush. I loved the peppermint scent and now I am off to make the mildew preventer. Thank you for this recipe. Is the peppermint oil for cleaning purposes or just for scent? I have a little kitty who likes to play in the shower and I know that essential oils are usually not safe for use around cats. Is the bathroom in the header picture of the blog post your personal bathroom? It is gorgeous, and I LOVE how fantastically clean it looks, that’s what drew me here in the first place! So, my actual question is–if that is your bathroom, is the tile not marble? It looks very similar to marble (which may be the genius of it), and you recommended your Lavender + Lemon Disinfecting spray which has vinegar in it. Just wondering, as we are wanting to re-do our master bath with some marble tiling. Thank you! Does the daily peppermint shower spray get mixed with water or just use as is? Does using vinegar or lemon oil break down grout sealant more quickly in the shower? What is your experience?